THE ADDRESS is an ultra-stylish coffee table magazine that curates a luxury lifestyle guide for living the good life. Inspiring people from around the world, the luxury property magazine focuses on the finest residential homes for sale and premium developments across the globe. This is also where food and travel meet in spectacular fashion. A must-have read for anyone serious about buying property, be it for investment, lifestyle or retirement purposes, THE ADDRESS Magazine delivers informative and precise information in an award-winning format that lavishes the readers with visually stunning imagery and elegant editorial. Here are 640 glossy pages of luxury served with an edge. Elevate your lifestyle with our curated selection of luxury real estate and homes for sale worldwide; from contemporary villas for sale to country estates, from luxury penthouses to elite apartments for sale. Do not miss our strikingly modern villa for sale in Pozuelo Madrid, which is an architectural triumph of superior design and remarkable quality. It is truly an exceptional property that will stun with its sheer grandiosity and dramatically contemporary style. An absolute show-stopper, the magnificent family residence captures the essence of luxury as well as personal comfort at its finest. Setting a style statement when it comes to luxurious real estate on the North Coast of Barcelona, THE ADDRESS Magazine showcases an exclusive property for sale in Maresme Barcelona that is sure to impress. An exceptional creation of visionary design and modern architecture, it is an aesthetic tour de force beyond compare. The benefits and beauty of living in a waterfront home are as vast as the stunning and unobstructed views enjoyed by our elegant apartment for sale in Cap de Nice. Housed in a historic palace property, it captures magnificent views comprising of the shimmering Mediterranean Sea and the iconic coastline. Set amongst luxuriant Mediterranean vegetation, the elegant duplex apartment offers a world-class coastal lifestyle with sun and sea on your doorstep. A beautiful vacation home in the South of France makes us dream of paradise. It does not come better than Château Capitoul, a magnificent vineyard estate close to Narbonne with panoramic views across the vines towards the sea and Pyrenees in the Languedoc-Roussillon region. A boutique collection of 45 fine Languedoc holiday homes for sale, Chateau Capitoul will deliver a luxurious yet casual elegance to appeal to upscale, quality conscious homebuyers who prefer a wonderful vacation home with outstanding indoor and outdoor amenities and services. Discover the joys of carefree property ownership at Chateau Capitoul and have a chance to experience the quintessential South of France experience. One of the most impressive properties for sale in Roquebrune-Cap-Martin, THE ADDRESS Magazine features a splendid historic residence that radiates elegant distinction in an exclusive setting. With the magnificence and architectural heritage of bygone era, this is an opportunity to not only own a true trophy property but also a piece of history. Looking to get experts to design your dream home in Spain, then do not miss our feature “The Easy Way to Build your Dream Home in Spain”. Modern Homes Worldwide’s partner is a one-stop shop, who will design and build for you — just the way you want it, and assist you in the processing of all permits and paperwork. Buyers are not limited to uniformed model houses of developers, because here property investors will be able customize their own home from floor to ceiling, from inside to outside. These affordable dream homes for sale are available in Mallorca*, Ibiza* and mainland Spain. The quality of life is just superb in the Algarve. From its rich cultural heritage, to its fantastic gastronomy and wine, from quaint traditional towns and modern urban centers, to wonderful sandy beaches and secluded secret locations in the unspoilt countryside, from music and food festivals around the year to a fantastic nightlife, it is easy to see why properties for sale in the Algarve are in such high demand. This issue of THE ADDRESS Magazine features a high-quality selection of luxury Algarve holiday homes including a luxury seafront villa for sale in Algarve whose cutting-edge design takes modern living to a whole new level, a luxury golf villa for sale in Vilamoura Algarve that offers a concept of beauty based on the purity of the architectural line, and a sensational beachfront property for sale in Albufeira Portugal that delivers an outstanding coastal lifestyle. Barcelona real estate market remains one of the world’s most dynamic markets, for good reason. Few cities can boast such an exciting mix of cosmopolitan city life, Mediterranean climate and beach life. It boasts an exceptional quality of life, an outstanding cultural and artistic heritage, stunning modernist architecture and world-class gastronomy, and a privileged geographical setting between the mountains and the sea, sunny Barcelona has it all. In this issue of THE ADDRESS Magazine, readers will find an elegant apartment for sale on Avenida Diagonal in Barcelona that would make a wonderful city centre home, pied-a-terre or investment property. Readers will also find a stunning Barcelona penthouse for sale, which blends modern, stylish living and city appeal in a prestigious address in Eixample, a luxury house for sale in Vallvidrera Tibidabo, Barcelona that boasts immense beauty and historic grace, and a classic Barcelona property in Plaza de Catalunya for sale that is distinguished by stunning Neo-Gothic architectural detailing and fine craftsmanship of a bygone era. A destination of classic glamour and timeless chic, the Cote d’Azur offers everything from snowy peaks to the cool azure blue of the Mediterranean Sea. Life on the French Riviera is incredible. The perfect climate, spectacular coastlines, stunning beaches, exquisite food and rich culture make this one of the best places in the world to buy a luxury property. THE ADDRESS Magazine showcases a great selection of villas for sale on the French Riviera including a modern Villefranche property for sale that is brimming with polished elegance, a stylish house for sale in Nice with sweeping city views, a prestige property for sale near Monaco with endless sophistication and style, a trophy home for sale near Monaco that is defined by exclusivity, distinction, and singularity, and a luxury hotel particulier for sale in Cimiez Nice that oozes the quintessential style and luxury appeal of the Cote d’Azur. Madrid, Spain’s elegant capital, has many calling cards: magnificent architecture, world-class art galleries, fine tapas bars and restaurants, exceptional nightlife, great shopping, and locals who truly live the good life. Cosmopolitan and modern, yet deeply, traditionally Spanish, Madrid attracts with its captivating lifestyle. With excellent transport links to the rest of the world, Madrid real estate is a great fine option whether you are relocating to Spain, buying a holiday home or preparing for retirement. This issue of THE ADDRESS Magazine showcases some luxury properties for sale in Madrid such as a luxury apartment for sale in Retiro Madrid that is characterised by classical elegance and a refined distinction – a signature address in a singular location. Readers will also find in our Madrid real estate feature an extravagantly scaled La Moraleja villa for sale that offers an indulgent living experience and a prestige villa in La Moraleja for sale where owners can enjoy the utmost grandiose elegance and luxury. With its beautiful hilltops, shimmering seashores, magnificent Renaissance masterpieces, winding cypress-lined lanes, splendid medieval architecture, excellent, award-winning wines and wonderful climate, it is easy to see why property in Tuscany is attracting international investors. THE ADDRESS Magazine features an inspirational selection of luxury Tuscany homes for sale including a stunning waterfront property for sale in Livorno Tuscany that comes with spectacular seascape vistas and dazzling aesthetics, a charming property for sale near Florence Italy that epitomizes a classically beautiful timelessness, and a modern Lido di Camaiore property for sale that is designed with a stylish contemporary edge. The article “Where there is a Will, there is a Way” focuses on one aspect that is often overlooked when buying property abroad. It is important to avoid unpleasant surprises with inheritance laws abroad. If you own any assets abroad or are considering investing in a holiday property in a foreign country, it is important that you think about making a will or reviewing your existing will to ensure that your wishes are carried out and your overseas assets pass to your intended beneficiaries. This is because, even if you have made a will under English law, it does not automatically guarantee that your overseas property will go to whoever you chose to inherit your property in your English will. The article “Thailand Residence – The Global Citizen’s Paradise” covers the country’s exclusive residence program which gives foreigners authorisation to live in the country for up to 20 years. It is the first program of its kind worldwide, offering unlimited access to the jewel of Southeast Asia as well as a range of special VIP privileges. The program was initiated by the Royal Thai Government to attract wealthy global citizens, families, investors and entrepreneurs who want to spend extended periods of time in the country and take advantage of its beneficial tax regime and affordable but exceptionally high standard of living. If you are looking to buy a holiday home in South of France, then the articles “There are many compelling reasons to buy property in Languedoc” and “For those in search of a property in the South of France, the town of Marseillan should be high on their list” are for you. Stretching along the Mediterranean coast between Provence and the Pyrenees mountains, this region offers an incredible natural diversity and a rich historical heritage, architectural and cultural variety. It is no wonder that the Languedoc area (part of the Occitanie, Pyrénées-Méditerranée) is consistently among the top choices as a preferred location for residential and holiday homes in France. Looking to find out the best neighbourhoods in Madrid to live, work and play in? In this issue we cover “Salamanca: Madrid’s Most Exclusive Barrio” and “La Moraleja: One of the most affluent areas near Madrid, which is a favorite among international expats.” If you are looking to find out which is the best neighbourhood to live in Barcelona, this issue covers “Sarria-Sant Gervasi”, a sophisticated area that is filled with green parks, shopping areas, interesting sights, and narrow and quiet streets. This neighbourhood has a distinct small-town feeling, making it very special. Whether luxury traveling is simply a dream or a fascinating fact in your life, check out this issue’s unique destinations and elegant villas to rent. Spain is perhaps the most diverse country in the world, with everything from white Mediterranean villages to sophisticated urban centres. Vibrant and cosmopolitan with beautiful architecture, Barcelona is one of the most exciting cities in the world. From the Pyrenees to Andalusia, Spain could serve as the backdrop for any kind of film, book or painting. It is also the world’s most seductive country, passionate about living the good life reflected on grand plazas in even the smaller cities, in well-preserved historic centres, and in the smallest of villages perched on hilltops. To top it all off, there are some of the world’s grandest, most powerful and incomparable architectural treasures, from the Alhambra to the Great Mosque of Cordoba. Here are 29 of the most amazing UNESCO World Heritage sites to visit in Spain. India is an incredibly huge and diverse country with so many amazing places to see that often the hardest part of planning a trip to India is deciding which places in India you simply can’t miss. From buzzing cities to ancient temples, flamboyant palaces and crumbling forts, from the desert to the snow-capped peaks and colourful monasteries, to the tropical beaches and backwaters of Kerala, there is no shortage of places to visit in India. For an unforgettable adventure, read our feature “Mesmerising India”. With its stunning mountains, fascinating old towns, spell-binding lakes, and long history, Switzerland mixes rural and urban beauty with astonishing ease, grace and precision. In our “Best of Switzerland” article, you will experience some of its most beautiful scenery and interesting cities with overnights in Zürich, St. Moritz, Lugano, Zermatt, Lake Geneva, and Vevey. Those looking for a week or two of unsurpassed luxury, endless days stretched out on the golden sand in an atmosphere of stunning sophistication and impeccable comfort, you will find our luxury holiday home for rent in St Tropez perfect. This stunning vacation home in La Croix Valmer is beautifully crafted, distinctively designed and endlessly elegant. With an epicurean travel magazine angle, THE ADDRESS invites our readers to discover 7 one-of-a-kind dining experiences throughout the world. These are places where it is not just the food that is cutting-edge, but where the attention to design and concept also help to truly create a full sensory experience. Each issue of THE ADDRESS Magazine features profiles and interviews with a leading chef, plus two of their signature recipes. In this issue, Aurelie Altemaire, Head Chef at Bōkan, Canary Wharf, London talks to THE ADDRESS Magazine about highlights of her career, culinary philosophy, her favourite ingredient, her most indispensable kitchen tool and much more. Aurelie Altemaire also shares her gorgeous lamb cutlets with aubergine caviar & chimichurri sauce recipe, as well as her stunning beef tartare with sesame crisp & wasabi mayo recipe. Finally, explore our photo essay “The Maldives – An Infinite Palette of Vibrant Colours & Pristine Beauty”. A visual feast with picture-perfect beaches, porcelain sand, azure waters, rustling palm trees, and underwater extravaganza, the Maldives epitomise the escapist idyll. 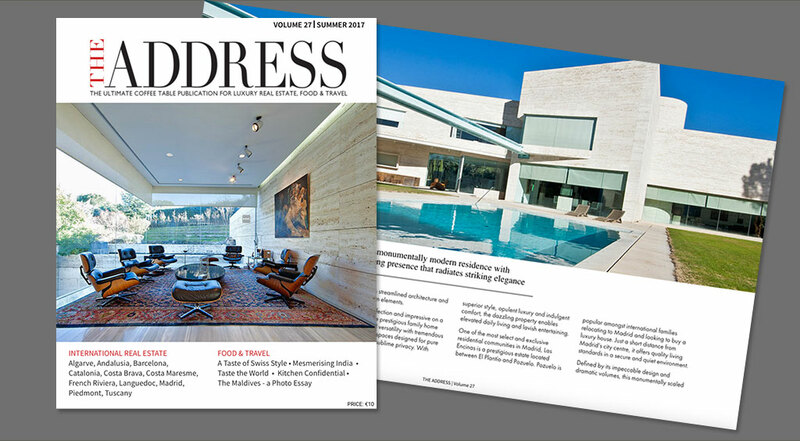 Click the link to enjoy issue 27 of THE ADDRESS Magazine, celebrating luxury homes for sale around the world along with inspirational food and travel articles.